Imagine an adorable looking skeleton with legs that would put a Victoria Secret’s model to shame decked out in a pinstripe black and white old-fashioned costume with a tail billowing in the wind, a bowtie which resembles a bat and you have Jack Skellington. Inspired by Jack Pumpkinhead from the Wizard of Oz, this animated character is a round, multi-dimensional garnering a serious fan following amongst Disney enthusiasts. Jack Skellington has been dubbed the patron saint of Halloween and embodies the spirit of Halloween, which he imparts freely as he works to scare as many people as he can on Halloween, all in good fun. His first appearance in the Tim Burton universe is actually in ‘Beetlejuice’, where his head perches on top on the canopy of the merry go round which rests on Bettlejuice’s head. However, his first appearance as the protagonist is as the ‘Pumpkin King’ of Halloween town in Tim Burton’s ‘The Nightmare before Christmas’ a stop-motion Disney film that was released in 1993. Chris Sarandon voices Skellington’s dialogue, while Danny Elfman voices his singing. His appearances are not only limited to films, but he also appears in a number of video games such as ‘The Nightmare Before Christmas: Oogie’s Revenge’, the Kingdom Hearts series and the Return of the Pumpkin King. The Pumpkin King is best described as an ‘undead gentleman’ who is not only calm and patient but also extremely graceful as he practically glides from one place to another. He can be quite intelligent and logical, as well as through – his research on Christmas was very extensive. However, his rationale can be questioned, as demonstrated by the incident where he simply goes along with the mere extent of his knowledge when he takes over Christmas. Similarly, Skellington can be naive and too trusting, as he decides to trust Lock, Shock and Barrel to bring him Santa Claus without any hurdles despite them being in trouble with the Oogie Boogie. Moreover, he lacks introspection and is impulsive, as he fails to see past himself and recognize the impact of his actions despite Sally’s warnings, as in the case of his ruining Christmas with the havoc he creates and failing to recognize the nature and extent of Sally’s feelings towards him as well as the fear he invoked in Santa Claus when they first met. He is cool headed, as he doesn’t lose his temper, maintaining the graceful demeanor he has, but he is also peppered with the curiosity and excitement of a child. Christmas enamors him, and he is delighted when he first encounters it, showing openness towards new things. His giddiness when handing out presents shows off a lighter, playful side towards him – he is not a cold, dark cynic. He further embodies the trait of childishness by maintaining untainted optimism that he will perform the Christmas Miracle perfectly until he fails. Even in his failure, Skellington demonstrates the integrity of character by being willing to set his wrongs right by admitting his mistakes and handing the reins back to Santa Claus so that he can save Christmas. Skellington is not evil, by any measure; he is misunderstood and perhaps human. Jack Skellington is a tragic hero who is at odds with his purpose in the world and is not entirely happy with the mundane routine that has become his life. Jack Skellington connects to the audience with his desire to have something more than the monotony that colors his life, as demonstrated in the song called Jack’s Lament where he shows that there is more to him than what it appears to be. He shows that there is more to life than fame, respect, and glory. The patron of Halloween is also endowed with supernatural powers and abilities. He is undead, therefore practically invincible, however, he can still die if he if his bones are ground to dust. Jack Skellington is able to dismember himself by removing his head and other body parts, which can be reattached and can control these with his mind. He is also very agile, performing leaps and bound in the air with the grace of a ballerina. Despite being a skeleton, he is also shown to be strong, lifting everything from huge presents to chubby corpse kids. His abilities are fleshed out further in the various video games he appears in. Skellington is shown to have a polished skill set as a fighter. In Oogie’s revenge, he is armed with a Soul robber which is a shapeshifting weapon which doubles as a whip and grappling hook. In Kingdom Hearts, he appears as a stalwart mage who can use magic, fire, electricity, and ice in his battles. His agility and grace appear to be advantageous as he uses them to carry out physical attacks such as knee slides. Furthermore, his bony hands double as claws, which he uses to slash at his enemies. In terms of personal life, Jack Skellington finds his romantic partner in Sally, a rag doll that was created by Dr. Finklestein. Skellington first brushes her aside, coming across as cold and ignores her premonition but in his failure, he notices her kindness and desire to help him. He chips away at his cynical streak by embracing and accepting love from Sally, whom he calls his ‘dearest friend’ and declares that they were meant to be by hugging her and stepping into a future with her where he has four to five skeletal kids as shown in the epilogue where Santa Claus visits them. Before Sally, he isn’t entirely void of attachment; he has a ghost pet dog with a glowing nose that resembles a jack o lantern called Zero which follows him around practically everywhere. Jack Skellington’s story is not limited to the movie. The video games produced by Disney carry his legacy forward as he embarks on various adventures with his Disney counterparts. Skellington appears alongside Goofy, Donald Duck, and Sora in a four-part series Kingdom Hearts. They battle Heartless and Oogie, and Jack Skellington is portrayed as an extremely powerful sorcerer with magical abilities. His capabilities vary from game to game, contradicting one another sometimes. In the video game, ‘The Nightmare Before Christmas: Oogie’s Revenge’ a bored Skellington leaves behind Halloween town to visit Dr. Finklestein and come up with new Halloween frights. When comes back, Oogie Boogie has come back to life and is creating a havoc. He sets out to restore order and uses a variety of skills such as dancing, fighting and singing, and his weapon, the Soul robber during battle, but he is portrayed as inept to a certain extent in the game. Skellington is extremely popular amongst fans and appears in Disney theme parks attractions and merchandise. His appearances are often seasonal, mostly occurring around Halloween and Christmas. At the Disneyland Resort, Jack steals the show in the Haunted Mansion Holiday, a special seasonal take on the Haunted Mansion which is active from September to January every year. Skellington dons the role of ‘Sandy Claws’ and brings a horrific flavor to Christmas set in the creepy Haunted Mansion. He also reprises his role as an emcee for the Halloween fireworks show every year and makes an appearance in the Frightfully Fun Parade as well. In Disneyland Paris, Skellington holds a meet and greets outside the Phantom Manor during the holiday season. He also extends these to Disneyland Hong Kong, at the Haunted Mansion and Walt Disney World. Skellington’s popularity also bleeds into merchandise. Clothing inspired by his attire, knick-knacks such as mugs, sketchbooks, canisters, socks, bottles, ornaments and necklaces are found for sale across various websites. One can also find Halloween suits inspired by the Jack Skellington costume as well as backpacks, all of which make for adorable possessions and engaging in cosplay. Skellington has also been immortalized in the form of toys. 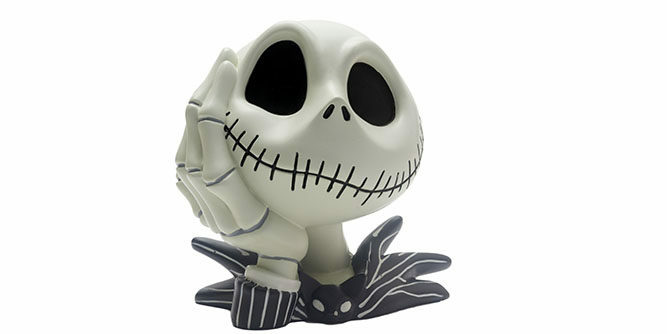 The Pumpkin King has been made into a Funko Pop Vinyl Figurine, which also came in a Day of the Dead variant. He was also made into a Bendies figure. Moreover, he also made an appearance in the Kingdom Hearts action figure collection and was included in Japan’s Revoltech Sci-fi line in 2010. Skellington was also made in an animatronic prop, which was life-sized, 6 feet tall and sold only at Spirit Halloween in 2016. Skellington also formed part of the Disney Infinity Toys to Life series. The Halloween time brings no surprise seeing kids with Jack Skellington tattoo and makeup. Also popular is Jack Skellington pumpkin carving, easier today with the help of Jack Skellington pumpkin stencil which one can find in lot of shops. Some kids choose to depict their favorite character in a Jack skellington drawing or even a Jack skellington wallpaper in their rooms. Jamie Frater summed up Jack as: ‘Jack is perfectly realized as the ‘town hero’ who seeks more in his life (or death, as it may be), a place we all find ourselves time to time’. His perception is not only insightful but effectively summarizes why Jack Skellington is so lovable. Despite being dead and animated, he paints a true depiction of what it means to live in the world. The character of Jack Skellington has been given accolades and awards, which are well deserved. The UGO dubbed Skellington as one of the best heroes of all times, while the Empire Magazine awarded him the 22nd place out of whopping 50 in their list of ‘50 Best Animated Movie Characters’. Why don’t you dig yourself out of couch and run for a better life?